Yandex declined to make any official comment on the release of Wonder. Source: Reuters. The Russian company plans to develop a Facebook app to keep track of friends. RBTH has learned that, in the coming months, Russia's Yandex will launch its new Wonder project. The mobile app will allow users to keep track of friends on Facebook and receive recommendations. Russian experts believe that the app will be fairly easy to monetize. 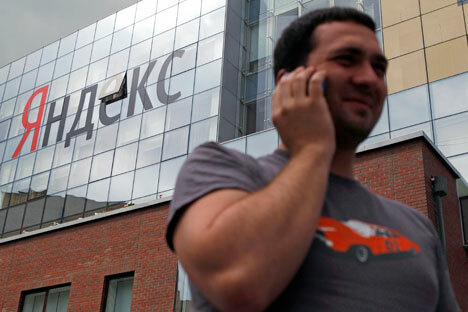 They also note that Yandex is looking to enter new markets, owing to slower growth in its home country. Yandex declined to make any official comment on the release of Wonder. "I can neither confirm nor deny the information," said spokesman Ochir Mandzhikov. However, he did not hide the company's interest in developing services for social networks. Another source for RBTH at Yandex, while preferring to remain anonymous, stated that the Wonder app is indeed in development and will offer a search tool for social networks; however, the source noted that the design and end functionality of the app had yet to be approved. It is known that, using ordinary and voice search to find places visited by the user's Facebook friends, Wonder will mainly focus on maps and geographical coordinates. The list will display not only locations, but also comments, photos, and mini-reviews. In addition, the app is expected to serve up a location and check-in map to keep track of where and how friends and colleagues on the social network spend their free time. "I understand why Yandex has its eye on social network search," says Pavel Nikonov, a manager at Bright Capital Investment. "It is suffering a slowdown in Russia due to market saturation. And besides, Yandex is still viewed by investors as a local company." Nikonov thinks that, if the new app is successful, it could help the Russian search engine become a truly international player. Yandex sees a bright future for mobile technology and is betting on the segment, as confirmed by its recent purchase of the St. Petersburg company SPB. Wonder has great potential, especially given the fact that increasing flow of data is making it harder to find relevant content, particularly on social networks. "Facebook friends can act as a kind of filter, while the app itself will help find and systemize the filtered information. In any case, if Yandex becomes a globally significant company, it will be a good sign for foreign investors," says Nikonov. Andrei Gershfeld is an investment manager at ABRT Venture Fund, which has invested heavily in Internet projects such as KupiVIP or Evernote. Gershfeld believes that the prospects for mobile local search and recommenders are looking good. "Wonder is just one way of using Facebook, and it shows the depth of potential in the social network platform," he said. Yet it is true that there is still no word about an agreement between Yandex and Facebook; the latter's Russian office declined to issue a statement.